When this strange, gray egg seemingly began to hatch in a family's backyard, they were unsure what the thick shell would yield. The egg was assumed to belong to some lesser known reptile or perhaps a rare and endangered species of some kind. The grayish thick outer layer soon gave way to what appeared to be a thin membrane and what lifeform it was hiding was certainly anyone's guess. Nothing prepared them for what emerged. Instead of an exotic reptile, some bright flesh-tones became visible through the membrane. 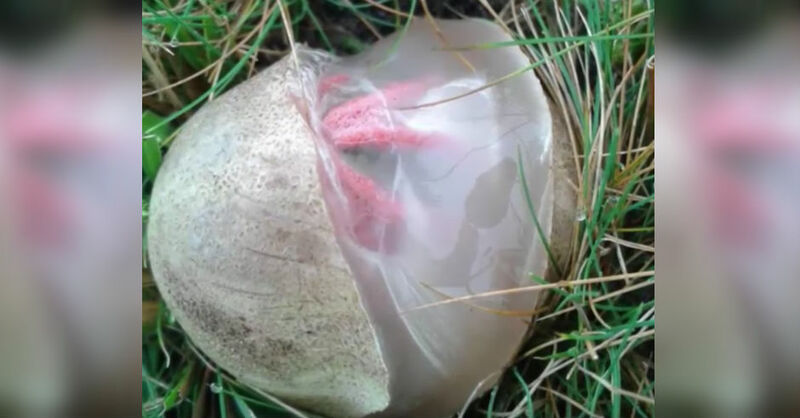 Some while later, the egg hatched to reveal bright pinkish-red tentacles. The egg was in fact not an egg at all and was instead a membrane sac for a fungus Clathrus archer, or devil's fingers. Like something out of a horror movie, devil's fingers are native to the warmer climates of Tasmania, Australia, and New Zealand. The interesting mushrooms were eventually introduced to the U.K. The devil's fingers, unlike most fungi, form inside of the sac with four to seven "tentacles" later erupting. The tentacles appear just like something from a nightmare with a putrid smell. The stench is meant to attract flies and the sticky surface to trap them for consumption.